Illegal cattle transportation: Mulki Police arrest two accused. Kinnigoli: July 11, 2015:The police have arrested two accused in charge of illegal cattle transportation near Mulki Bappanadu Checkpost on Saturday Morning July 11. 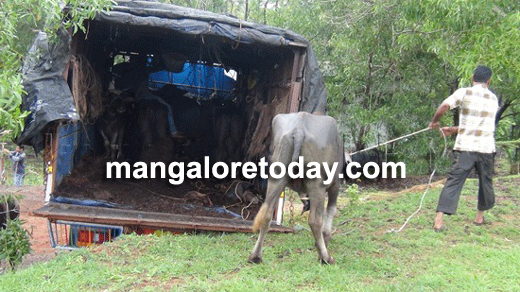 The accused were illegally transporting cattle in a lorry from Yallapura to Kasargod. The accused has been identified as Sameer and Mohiddin Kunni. Mulki Circle Inspector Ramachandra Nayak, ISI Dharmendra, Sudhir, Prakash, Tharanath, Mohan arrested the accused.